Welcome to Begbies Traynor Aberdeen. We are a group of licensed Insolvency Practitioners in Aberdeen offering services to help companies with either rescue or closure options. Aberdeen Address 7 Queen's Gardens, Aberdeen, Aberdeenshire, AB15 4YD. 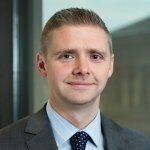 Thomas McKay leads our Aberdeen office and has a wealth of experience in business finance and restructuring. A Chartered Accountant by trade, Thomas has rounded expertise when it comes to advising business owners, directors and also creditors with the issues they are facing. He heads up a team of dedicated and experienced insolvency specialists who provide crucial support and advice on a full range of issues across debt management, corporate restructuring, bankruptcy and administration. The fact that Begbies Traynor has offices across Scotland and the rest of the UK, means that we can call on the expertise of dozens of specialists in different areas and help our clients tackle the worst of their debt management fears. Whatever the scale and scope of the financial problems our clients are facing, we have the skills and the experience needed to support individual directors through what can be extremely testing times. If your own, or your company’s debt problems are starting to spiral towards financial disaster then you need to act quickly and prudently to avoid the worst potential outcomes. Begbies Traynor can help you do that, and will explain the available options both clearly and concisely. There is generally no easy way to resolve a worsening financial situation or the reality of insolvency when it arrives, but there are options for directors facing these kind of difficulties and important choices to be made. The sooner you call Begbies Traynor to discuss your problems, the sooner we can start supporting you in finding a solution to the issues at hand. For a free initial consultation, do not hesitate to contact your local office today. We do have further offices in Scotland which are located in Dundee, Edinburgh and Glasgow which you may find more convenient for you. Begbies Traynor, the liquidators of registered charity Peterhead Projects Limited, have completed the sale of Peterhead Lido Caravan Park to a consortium of the caravan park residents enabling the caravan park to continue trading.